FOSJOAS K1 is a comparatively new model released by Moben Global Inc. in last year. Moben Global Inc. endows it with the design of skateboard and powers it with Sony-made battery group. It shares the same exterior design with the traditional skateboard. Perhaps, out of recalling the childhood or passion for the skateboard, Jo bought one set of FOSJOAS self-balancing unicycle K1 last week. Compared with the traditional skateboard, Jo said the design of battery group and stickers were the main draw. However, he admired the wireless remote control the most. The newly released electric skateboard K1 can be controlled via remote controller. When Jo was a child, he loved the skateboard very much. On the day when Jo has a try on it, he is good at the skateboard. That is why he can steer FOSJOAS electric scooter K1 in a deliberate manner. 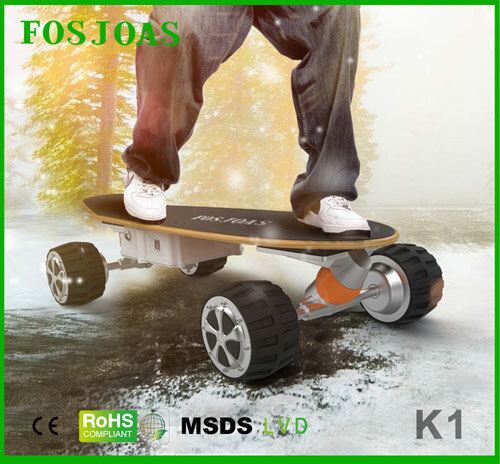 During ride of wireless remote control skateboard FOSJOAS K1, the speed of FOSJOAS K1 is adjusted via a remote controller. The technology of wireless connection control is introduced in it. Jo thinks highly of the introduction of this technology in FOSJOAS K1. The wireless connection can reach the range of up to 10 metres. Even there is a wall in front of the remote controller, it can still penetrate the wall and control the FOSJOAS K1 as long as K1 is within the range of control. The wireless remote controller of FOSJOAS K1 cheap electric skateboard is quite compact. It can be easily held into the palm. When Jo rides FOSJOAS K1, he always put the wireless remote controller in to his pocket. Once it is needed, then he whips it out. Of course, as he scoots about on the electric self-balancing scooter, he is still able to manipulate FOSJOAS K1. It is possible to adjust the speed and turn on/off FOSJOAS K1 via this delicate remote controller. Just on that account, Jo gets having passion for it. Next：Fosjoas Electric Scooters Enters The Gift Store Of Bruce.